There are a lot of funny moments in the play, starting with the opening (and closing) party for the Broadway musical Eleanor (Roosevelt). After the success of Hamilton, who could see that failing? The stars Dee Dee Allen and Barry Glickman are understandably depressed about it bombing – and why wouldn’t they be? They have HUGE egos. They are caricatures of narcissistic Broadway stars, Dee Dee a (gay) icon and Barry – who is just over-the-top flamboyantly gay. They’re joined in the foursome of Broadway travelers by Angie (always in the chorus, never the lead) and Trent (the waiter/Julliard grad embarrassingly known for his past sit-com character role). Not surprisingly, they burst into the Indiana high school with their own agenda, and are not greeted too kindly. The school officials would rather handle this themselves. The PTA president is horrified to see these creatures (who only the principal recognizes) invading their space. And the Broadway actors make it very clear (in a funny song and dance number) that it’s really all about them. Even though they say it’s not. Sort of. The girl causing the school uproar is Emma, who just wants to dance with her unnamed girlfriend (spoiler alert – it’s the PTA president’s daughter). While the school kids and their parents may be homophobic, it’s an interracial cast, which is nice to see – no mentions or concerns by the Pence voters about that. 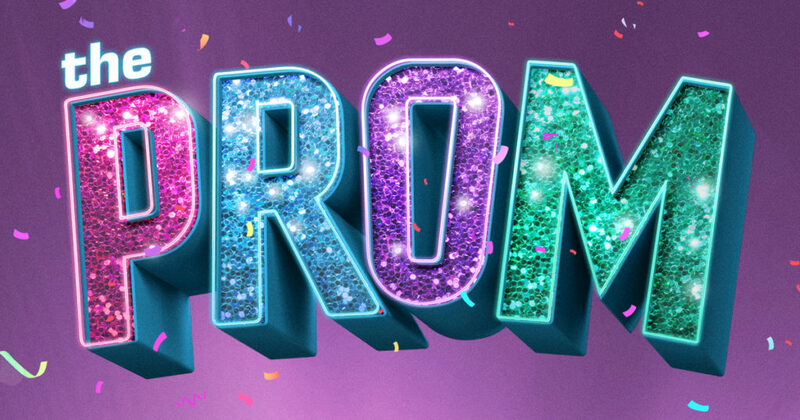 Emma is taken under the Broadway stars’ wings, as they insist on being her mentors whether she likes it or not – and getting her ready for the prom, which is planned in spite of the earlier cancellation. Of course it doesn’t go as planned. There’s other romance as well, as Dee Dee and the high school principal hit it off, after multiple dates at Applebee’s. 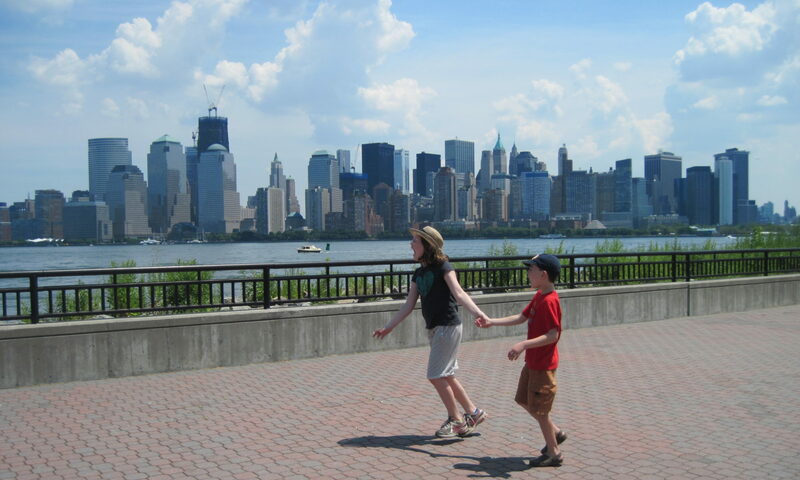 Due to the traveling Broadway show’s convenient cancellation, they stay in Indiana much longer than they should have, opening kids’ minds and learning some lessons of their own. I won’t spoil the ending, but there’s plenty of balloons and singing. And Barry gets to go to the prom, even though he didn’t go to his own. Not shockingly, the costumes and dance numbers were awesome, especially the stadium number (I won’t go into detail). As long as you’re not going to be offended by the idea of gay people, you should enjoy the show. Is The Prom appropriate for kids? Is The Prom appropriate for kids? In my opinion, it is appropriate for mature kids. I can’t put an age on that, because it depends on your kids. I know middle schoolers who loved it, and probably some elementary school kids would as well. There are some curse words used. There is some female/female kissing (nothing major). The idea of a lesbian high school couple is of course central to the show theme. If any of the things I mentioned is an issue for you, then it may not be a good show for you or your kids. The show recommends it for kids 8+. Like me, my high schoolers enjoyed the show. Perhaps they’re jaded, but they thought it pandered a bit too much to the audience with some shout-outs to New Jersey audience members, a script that was too predictable, too overt (there’s very little nuance) and very loud assumptions that everyone who likes Broadway shows is gay. Yes, it’s all funny and fun, but at least the Prom doesn’t take itself too seriously. The show runs 2 hours and 30 minutes including intermission. And amazingly, the ladies’ restroom has plenty of stalls. 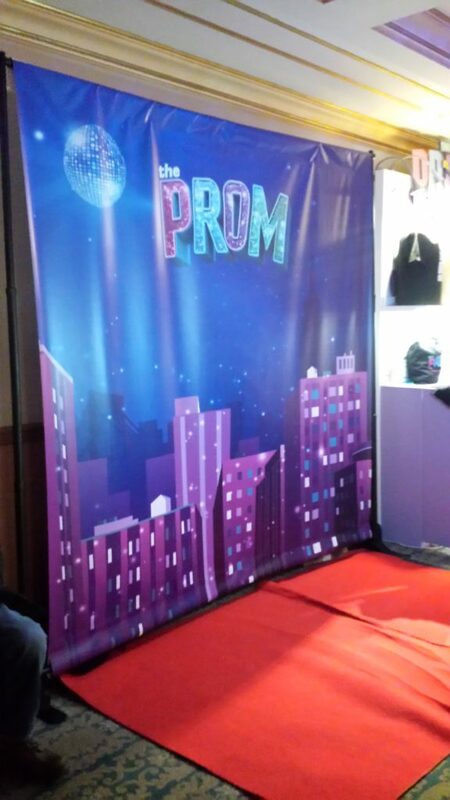 Go downstairs to get your picture with a Prom backdrop.